There’s no stopping Brackley Town at the moment as they made it five straight wins to remain top of the Vanarama National League North. 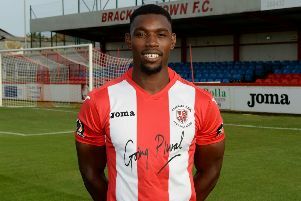 Goals from Lee Ndlovu and substitute Mat Lowe saw Saints beat Spennymoor Town 2-0 at St James Park. Both sides carried 100 per cent records into Saturday’s game and it was Saints who maintained their winning start to the season in a tight contest of few chances. A well contested first half saw little of Town’s fluent passing and the home side needed a well timed tackle by captain Gareth Dean to keep the scores level as halftime approached. But Saints got their noses in front with Ndlovu’s 42nd minute header after Alex Gudger nodded Shane Byrne’s corner back across goal. The second half continued to be hard fought but began to open up and both sides sought the next goal. Saints’ keeper Danny Lewis was called into action saving well from Joe Tait at close range just after the hour mark. Ndlovu’s header then struck the bar as Saints went close to extending their lead. In the final minute Spennymoor’s James Curtis was sent off for a second yellow card offence and Lowe immediately doubled Saints’ advantage, neatly picking his spot after a delightful exchange of passes with Jimmy Armson to create the chance. “It was a gritty performance,” said Saints manager Kevin Wilkin.